This house we simply call the Stone Double House. As you can see by the two doorways, this was a two-family ironworker's house. However, the stonework is much more substantial than that of the Milligan -Harty House. The stones are larger and are laid up in mortar, the walls are almost two feet thick. The house was gutted by fire in 1983. 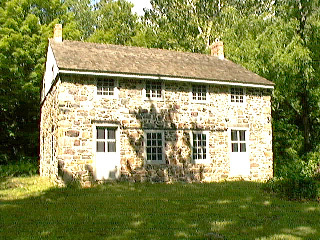 Restoration of the stonework and a new roof was accomplished in 1995 as part of a grant from the New Jersey Historic Trust and the State of New Jersey. These funds also restored the exterior of the Milligan -Harty House, the Visitors Center, work on the waterwheels and complete mapping surveys.